Ground offensive could result in reoccupying Gaza, Gilad Erdan says, but no decisions have been made yet. Israel is considering launching another heavy ground offensive into Gaza, Communications Minister Gilad Erdan (Likud) indicated Saturday, in the wake of renewed rocket fire and an exodus of Negev residents from their homes. "Has the decision been made? No," Erdan stated to Channel 2 News. "But we are closer to it than we ever have been." 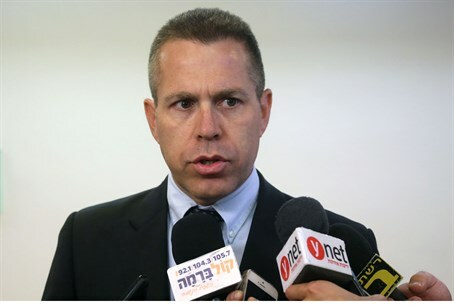 A ground offensive would be the most extensive so far since the 2005 Disengagement, Erdan said. No matter what, he stressed, Israel would take action. "We are committed to this operation, and making sure it does not revert to how life was before," Erdan emphasized. "But we need patience and determination." "We cannot revert everything such that Hamas will be able to rebuild everything it has lost, and it has lost a lot - many tunnels, a considerable amount of its rocket arsenal, and several leaders," he added. "Hamas continues to fire rockets at us and it is not working [to scare Israel]." "Hamas continues a war of attrition and we are pounding them by air, but this is not a situation that can persist for weeks," he continued. "The purpose of a ground offensive could be retaking Gaza fully and the collapse of Hamas rule, or specific attacks on the organization itself." There have been multiple calls for Israel to retake Gaza in order to deal with the rocket threat from the Hamas-controlled territory. The most vocal calls have come from Foreign Minister Avigdor Liberman (Yisrael Beytenu), who has said time and time again that the only way to eliminate the rocket attacks is to take over Gaza; Finance Minister Yair Lapid (Yesh Atid) and former Israeli National Security Adviser Yaakov Amidror made similar comments several weeks ago. Operation Protective Edge began again last week after nine days of quiet; over the past 24 hours, at least 86 rockets were fired into Israel. Four year-old Daniel Tragerman was killed Friday from a mortar shell strike on Kibbutz Nahal Oz, sending most of its residents elsewhere and prompting strong responses from Israel's political echelon. "The IDF and the Shin Bet (Israel Security Agency) will intensify the operations against Hamas and the other terrorist organizations in Gaza until the goals of Operation Protective Edge are achieved,” Prime Minister Binyamin Netanyahu vowed shortly after news surfaced of Daniel's death.